After some very busy weeks at work and a long vacation, I am finally ready to post Part 3 in my debate with Russell on the New Testament priesthood. Also see Parts One and Two. The topic of this debate has basically shifted to the Sacrifice of the Mass, but I'm okay with that. As Russell has pointed out, there is no ministerial priesthood without a sacrifice to offer. As such, confirming the Eucharist as a sacrificial meal validates the presence and purpose of a ministerial priesthood in the Church. This entry in the debate is pretty long, but I hope that you will hang with me. I think there's some good stuff here. Russell's words will be indented and italicized. Not a problem. My responses are usually just as long, if not longer. Catholics don't miss the point of this sign/miracle. We just don't think it means what you think it means. I agree that the tearing of the veil symbolizes man's greater access to God (cf. Heb 4:14-16; 10:19-22). But, the ministerial priesthood that is symbolically abolished by this rending is that of the Old Covenant. This is clear from the context and from what we read in the Letter to the Hebrews. At any rate, the New Covenant ministerial priesthood is a new and better priesthood than what the author of the Letter describes as "vanishing away" (Heb 8:13). For one, it is concerned with doing what Jesus did (cf. Lk 22:19), that is, making present the New Covenant in His Blood (cf. Lk 22:20; 1 Cor 11:25), not the Old Covenant blood of sheep and goats. Secondly, what the New Covenant priest offers is not the repeated sacrifices for sin of the Old Covenant but the one sacrifice of Christ, continually made present so that we can, as it were, "go forth to Him outside the camp" (Heb 13:13) and be "sanctified through the offering of the body of Jesus Christ once for all" (Heb 10:10). The Old Testament ministerial priesthood has served its purpose. It was a “type” and a “shadow” that pointed to something greater, and HAS BEEN FULFILLED in Jesus Christ (the Perfect Sacrifice). There was only one offering by Him (Hebrews 10:12, 14), and it was “once for all” (10:10). No more offering (sacrifice) for sin is needed (Hebrews 10:18). So, that type of sacrifice and its priesthood is now unnecessary. I agree. The Old Testament ministerial priesthood has served its purpose. It is now unnecessary. In fact, the whole book of Hebrews screams out to us that the ministerial priesthood is abolished. See also here. The whole book of Hebrews screams out to us that the Old Covenant ministerial priesthood is abolished. Like I've said, and hope to further prove, the New Testament ministerial priesthood is something new and better. It has a purpose still to serve. The priestly service that is of the gospel is the offering of the Gentiles. I realize that we are all called to bring people to Christ and His salvation, but this work is also characteristic of the ministerial priest. And since Paul is not your typical layman, since he is Christ's "minister" (cf. Rom 15:15; Col 1:25)) fulfilling a special "office" (Acts 1:20; Col 1:25), I don't think he is referring to the work of all believers. He is identifying himself with the ministerial priesthood by describing his work in that manner. Early Christians, in documents too numerous to list, did not hesitate to use this same Gk word to refer to men who held a unique office in the Church, administering sacraments and celebrating the Mass, which they considered to be a sacrifice. They understood the presbyters of the NT as having the same function and office as these men. It is a historical fact that πρεσβύτεροι was used and understood in this way. I don't really know what else to say. 1 Corinthians 10:16-21 – Although Paul does mention Christian Communion, i.e., the partaking of the bread and wine, his whole point in this passage is about abstaining from idolatry (10:14). Specifically, he wishes them to abstain from eating food that has been offered to idols, since this amounts to idolatry. He does this by drawing a parallel between the Jewish sacrifice, the pagan sacrifice, and the Christian Communion. Yet, there is no parallel if the Christian Communion is not also a sacrifice. Terms like “cup,” “table” and “altar” that Paul speaks of are simply symbolism, representing our participation and identification with Jesus Christ. Secondly, don't forget that the Eucharist was instituted within the context of the Passover meal, in which lambs that were sacrificed on an actual altar were actually eaten and Jesus picked up an actual cup and said it was His Blood. The "cup of blessing", which Paul says is a participation in the Blood of the Lord, is the name for the third cup of the Passover meal. It is an inescapable fact that these are actual items that were found in the Christian Communion and worship ... and they are all the things of sacrifice. You’re insisting that these are literal, but if these are literal then must we also literally purchase, kill, and burn our New Testament sacrifices today, as well? Of course, that’s a ridiculous (if not blasphemous) idea, but this is where this type of logic leads. That's not true. Jesus showed us at the Last Supper that the Eucharist was a sacrifice, but of a different kind. It would no longer require the bloody offering of animals but instead the unbloody offering of Christ under the appearance of bread and wine. I realize this remains to be proven. I shall do so shortly. This “literal” argument doesn’t work here. All this terminology is pointing to Calvary, i.e., to Jesus’ suffering on the cross, not to a ministerial priesthood with literal tables and altars. Ya know, I'm fine with that. The Eucharist points to Calvary. It has tremendous sign value. I don't deny that. But, I think it points to Calvary because it makes the sacrifice of Christ substantially present. But OF COURSE there is “sacrificial” language and “priestly” overtones here… once again, this is all pointing to Jesus’ work and suffering on the cross; He is our Perfect Sacrifice and our High Priest! All the typology and the “sacrificial language” is fulfilled in HIM! 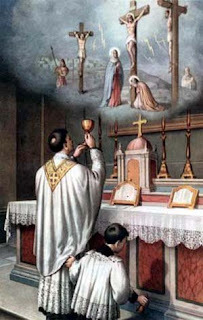 It is NOT fulfilled in the Catholic Eucharist. Jesus is our perfect sacrifice: Amen! Jesus is our High Priest: Amen! All the typology and sacrificial language is fulfilled in Him: Amen! 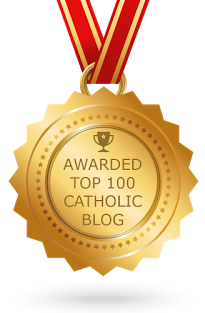 How then can I believe in the Eucharist? Because I believe (and the Church teaches) that it is in the celebration of the Eucharist that the grand drama of Jesus' high priestly work unfolds before us for our benefit. Jesus is the priest who makes the offering. Jesus is the offering. Jesus is the altar upon which the offering is made. Jesus is the New Covenant. The bread is Him. The wine is Him. The priest is His instrument who stands in His Person, in obedience to His words, "Do this in memory of me" (Lk 22:19). It's all about Jesus and affirming His unique work and power. Perhaps Paul's discussion of Christian Communion is filled with "sacrificial language and priestly overtones" because it's an actual sacrifice, the sacrifice of Christ. It is all about a PAST event (Calvary), not about a “continual offering” to God. So, all this sacrificial language does not make Paul or any other Christian some sort of ministerial priest. Once again, biblically, this office does not exist, and is only there if you read it into the text. For one thing, Christian Communion is not simply about remembering a past event. After all, the Passover meal, in which Jesus instituted Christian Communion, is not itself simply about remembering a past event. When the Jews celebrated the Passover, it was a mystical making-present of the very same salvation from slavery and death that their ancestors experienced. It was as if the Jew, though separated from the first Passover by several thousands of years, became, through the celebration of that same meal, one of the very ones fleeing Egypt and the angel of death. And so it is with the Eucharist. Remember, Paul even called the cup of Christian Communion "the cup of blessing". Perhaps this is because, in his mind, the cup of Christian Communion and the third cup of that last Passover meal are the same cup. At the Last Supper, Jesus replaced one mystical re-presentation with a new, fuller, and better one. Secondly, the Letter to the Hebrews is very clear that Jesus' work on Calvary is more than just a past event, it is in fact continually offered to God. Like I said in my last post, Christ has entered into heaven itself "now to appear" in the presence of God on our behalf (Heb 9:24). Not one time a long time ago, but now. "Consequently he is able for all time to save those who draw near to God through him, since he always lives to make intercession for them" (Heb 7:25). "To make" is in the present tense. John said of his vision of heaven, "I saw a lamb standing as though it had been slain" (Rev 5:6). Jesus is depicted as a lamb 28 times in the Book of Revelation. Why would Jesus still appear in heaven as a passover lamb if He did not continually offer His sacrifice to the Father for us? God desires that from the rising of the sun to its setting a pure offering be made (cf. Mal 1:11). I'd imagine that one reason why you resist the notion of Christ continually offering Himself to the Father is because, in the Letter to the Hebrews, one thing that makes the Jewish sacrifices so deficient is the fact that they had to be continually performed -- and this is set in contrast to the one sacrifice of Christ. "The priests go continually into the outer tent" (Heb 9:6), "sacrifices which are continually offered year after year" (Heb 10:1), I get it. But, the Eucharist does not revive again what made the Old Covenant sacrifices deficient. There is a difference between multiple sacrifices of various animals and one sacrifice perpetually offered. The sacrifices of the Old Covenant ministerial priest were of the first kind. The sacrifice of the New Covenant ministerial priest is of the second kind. This is a crucial distinction that must not be forgotten in this debate. We don't have multiple offerings, we have one offering without end, and every time the Mass is celebrated this offering is made present and it's merits applied to us. I don't deny the once-for-all atmosphere of the Letter to the Hebrews. I just don't think that the Sacrifice of the Mass contradicts this. Do you understand why I would think that? Interesting! You taught me something new here. I'll admit that this is a difficult passage to understand. It seems to me that the use of the plural in the place of the singular would more readily indicate the Mass, in which, in a mysterious way, the sacrifice is plural and singular. But, I'm also okay with understanding the passage as expressing the superlative excellency of Christ's sacrifice. Nothing about the Church's teaching about the ministerial priesthood or the Mass should be seen as denigrating that excellency. There is still much more from Russell's response that I need to address, but this post is already quite long enough. I also anticipate having to make a rather lengthy argument in defense of the sacrificial nature of the Eucharist, and this is best served with a post of it's own. So, I'll end it here and finish up with a subsequent post in a day or two. PS: From here you may proceed to Part 3b. I will wait and hear the rest of your comments when you complete your article(s) before I respond. I’ll just respond at the end of your last post. Thanks.